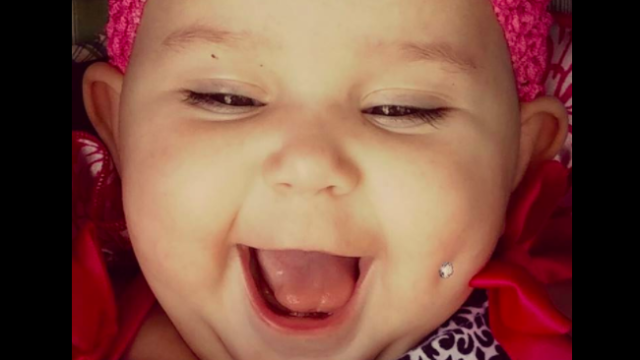 A photo of a 6-month-old with a cheek piercing has gone viral on Facebook, with over 11,000 shares and hundreds of comments. One problem with all the outrage: The piercing is digitally created. Enedina Vance considers herself an activist against body alterations in children. She speaks out against circumcision as well as ear piercing in babies. “It should be each person’s choice what to do with their bodies. Not even your parents should be able to decide," she told Yahoo. To make her point, she decided to Photoshop a cheek piercing onto her daughter. "It looks so cute, right?!! I just know she's gonna love it!! She'll thank me when she's older lol If she decides she doesn't like it, she can just take it out, no big deal," she wrote on Facebook to accompany the photo. "I'm the parent, she is MY CHILD, I will do whatever I want!! I make all of her decisions until she's 18, I made her, I own her!! I don't need anyone's permission, I think it's better, cuter, & I prefer her to have her dimple pierced. Its NOT abuse!! If it was, it would be illegal, but it's not. People pierce their babies everyday, this is no different." The caption ended with a reveal that the picture with a hoax. Enedina capped off her post with the hashtags "#BodilyIntegrity, #MyBodyMyChoice, #HumanRights, #ChildrensRights, #Intactivism,#IntactGeneration" and most importantly, "#sarcasm." Unfortunately, not everyone who saw the photo took the time to read all the way down to the bottom of the caption. Commenters came out in support and in anger against the (again, fake) piercing. Vance spoke to Yahoo about the thought process behind the photo, as well as how people have reacted. "I can’t believe how many people actually believe my photo is real," she said. "So many people are outraged at the thought of piercing my baby at such a young age, without her consent, and against her will. Yet, they don’t understand how other body mutilations, alterations, and modifications are the exact same thing for the exact same reason: aesthetic purposes." Whether it was read as intended or not, the post certainly did its job — it got us talking about body alterations in children.